Thank you for visiting! Feel free to browse and stay as long as you like. Xtreme Vixens believe in building a solid sisterhood of strong, independent, and responsible women who are enthusiastic about riding motorcycles. Along with our passion for two wheels, we use our collective efforts to support the community by actively participating in activities for equal motorcyclist rights, volunteering, hosting, and supporting fundraisers and charitable events. We also offer guidance and support for new riders by planning safe rides at a comfortable pace to build their confidence and riding skills. We love to meet new people and help any way possible, so if you have any upcoming events, we'd love to know. It doesn't matter if you're in a MC, RC, SC, an independent rider, or maybe not even a rider at all, but enjoy the culture. We are ONE community! Founder Nina, aka Chixxr, established the Sanctioned MC Xtreme Vixens in 2006. Xtreme Vixens, LV is the first Sanctioned MC in Las Vegas to stand on their own proudly representing women on sport bikes! Something almost unheard of in the motorcycle community! In 2012, Xtreme Vixens MC made the club open to all motorcycles, not just sport bikes. We believe that the love of riding on two wheels is universal and it should be embraced and celebrated with all riders! In 2016, we debuted our new logo, designed by Shizuka, aka Samurai Girl. Its enhanced look reflects our club stylishly while staying true to our original roots and what we strive for. We love to meet new people who also share a common interest and passion for motorcycles! We are always looking to take some good road trips, so let us know what's going on even if you live out of state! Feel free to hit us up if you're interested in riding with a diverse and fun group of ladies! 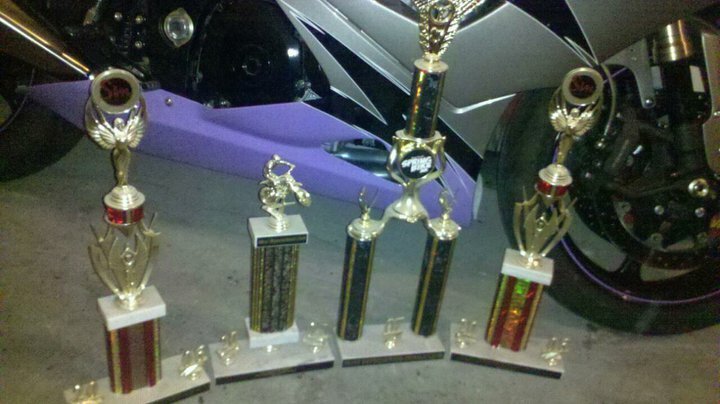 ​Nina & Las Vegas chapter were recognized and awarded with trophies at many MC events since its inception. "Life is not a journey to the grave with the intention of arriving safely in a pretty and well preserved body, but rather to skid in broadside, thoroughly used up, totally worn out, and loudly proclaiming 'WOW, What a Ride!'"